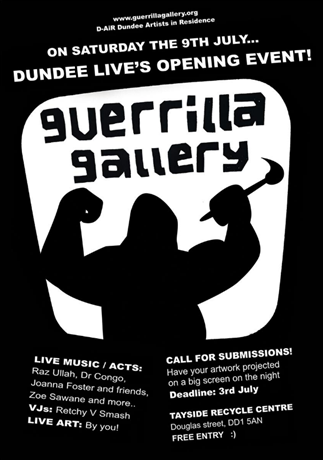 I will have some artwork exhibited at a Guerrilla Gallery event in Dundee on the 9th of July. A poster for this is below. The work I will have exhibited includes the Polaroid Pictures I have been creating. This exhibition is very cool and will be similar to the last Guerrilla Gallery, where the artwork was projected onto a wall inside the Tayside Recyclers building. I may take my camera along with me and take some photographs.